Below you will find details about our home, Pacific Paradise located just steps away from Ocean Beach! Welcome to our grand retreat in Ocean Beach, providing the ultimate experience of relaxation, accessibility and fun at our Pacific Paradise! This modern functioning beach property provides dramatic views of the Pacific Ocean. Spend hours mesmerized by the sunlit water while you watch dolphins, surfers, sailors, sport fishers, whales and people at play. All of this is within your view from the home's main living areas & spacious furnished patio/deck. The floor plan has an open flow and the space is light & airy with sky lights and sun-soaked plantation shutter covered windows. All rooms have recessed lighting, ceiling fans & Saltillo tile floors with area rugs. Cushy carpet is installed in the master suite & primary living area. The reverse floor plan is conducive to everyone young and old making it the perfect solution for singles, couples or families! This 2 bedroom 2 bath home is approximately 1,500 sq. ft. The Great Room includes the living room, kitchen and dining room. The counter height island incorporates a gas stove top and provides extra seating in the center of the kitchen/dining area which is optimum for views. French doors open out to the furnished patio/deck which extends out from the kitchen. The Entertainment central part of the house includes a fireplace, TV/Stereo, love seat & queen sized sofa/futon with a 10 memory foam mattress to accommodate additional guests. The primary master suite is upstairs to the rear and has a walk-in closet, double vanity bathroom with step-in shower and a queen sized bed. A mirror on a large chest of drawers balances the room and provides storage in addition to the walk-in closet. Downstairs is the second bedroom that includes a closet with built-ins, tile bathroom, and shower. This room includes 2 full-sized memory foam beds and a dresser for additional storage. The separate office and laundry room combo gives you a place to browse the web in search of local events and printer for airline tickets. On-site laundry is provided. At the foot of the staircase are steps to the garage where the recycling container is stored. This is also a secure location for surf boards, bikes, golf bags, etc. The house sits back off of the street and there is parking for 2 vehicles in the front of the garage in the driveway. Street parking is available as well. Also around the house exterior are places to hang wet towels & rinse off after spending time at the beach! There are ceiling fans but NO A/C in this home. Sea breeze! Saratoga Park is at the foot of the street. This grassy park has concrete benches, fire pits and outdoor BBQs available to the public on a first come first serve basis. The white sandy beach is only 1/2 block away with Newport Avenue (antique stores, restaurants, shops, boutiques, coffee houses, bars & more) just 2 blocks away. This is close for convenience but far enough away to still enjoy your privacy, peace & quiet (because of the reverse floor plan). 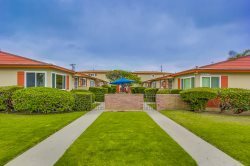 Within walking distance to the beach, famous Ocean Beach Pier, Parks, Tide Pools, Surfing, Volleyball, Robb Field, amazing bike & walking trails, San Diego River Nature Preserve, Sunset Cliffs Natural Park, & so much more... There are many storefronts in the heart of OB that offer rentals for bikes & surfboards. Live like a local and check out the different staircases at the dead end of the streets along the Cliffs. These provide access to tide pools, private beaches and surf spots. Watch a green flash sunset from the Cliffs where the scenery continues to be postcard & wedding backdrop worthy. On the Northside of Ocean Beach is Robb Field, San Diego Nature Preserve, bike/walking paths & a Dog Beach. The asphalt path takes you over/under the bridge to get to Mission Bay, Fiesta Island and runs along the San Diego River into Mission Valley. On the Southside of Ocean Beach is Sunset Cliffs Natural Park and further out on the point is Cabrillo National Monument with breathtaking views of all of San Diego, local mountain ranges, Coronado Island, Mexico and even some occasional whales! Ocean Beach has a strong sense of community with ongoing weekly and annual events. Wednesday night is the weekly Farmers' Market where local growers sell organic produce & fresh flowers. Vendors also serve food & sell handcrafted items by local artisans. There is always live music and rides for the kids! Special events such as the Holiday Parade, Ocean Beach Street Fair & Chili Cook Off, Fourth of July Fireworks, Oktoberfest, Music Festival & much more are held throughout the year. Ocean Beach & Point Loma is positioned on a Peninsula. The ocean side is Ocean Beach & Sunset Cliffs and the harbor side is Point Loma & Shelter Island. Point Loma is just a couple miles over the hill and is home to Liberty Station and Point Loma Village offering more restaurants, amenities & services. Downtown San Diego & Gaslamp Quarter is only 7 miles from Ocean Beach with Balboa Park only about 10 miles away. Balboa Park is home to many of the city's largest attractions such as the San Diego Zoo, San Diego Museum of Art, Old Globe Theatre & much, much more. Over the bridge is Coronado Island which is home to the historic Hotel Del Coronado and our Navy base. Up the coast is Mission Beach, Pacific Beach, La Jolla, Torrey Pines & Del Mar. Whether you enjoy beach combing, sun bathing, sailing, surfing, boogie boarding, sport fishing, exploring tide pools, riding or walking the bike path(s), golfing, playing tennis, concerts or watching for distant whales, you will never be at a loss for something to do. There are endless golf courses throughout San Diego. Mission Bay and Presidio Hills are within 7 miles. Barnes Tennis Center is at the entrance into Ocean Beach off of the Fwy 8. An additional charge applies for more than 4 guests in this home.